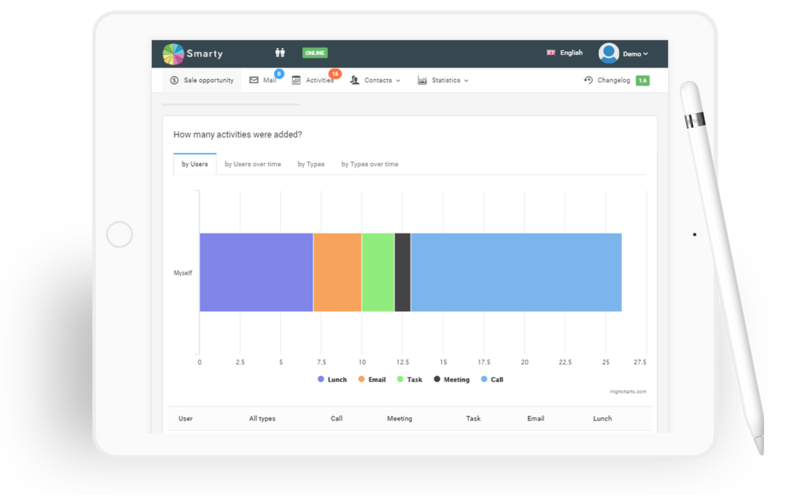 Smarty CRM creates intelligent reports that break down data and metrics to show you what’s working and what’s not. You can also easily visualise your reports through a variety of graphs and charts which will show you, in a glance, how to improve your business. These reports can be saved stored, downloaded as PDFs, printed or shred with colleagues. These reports will also be used to compile data on how your pipeline value is changing allowing you to easily see what changes have been good for your business and which haven’t. 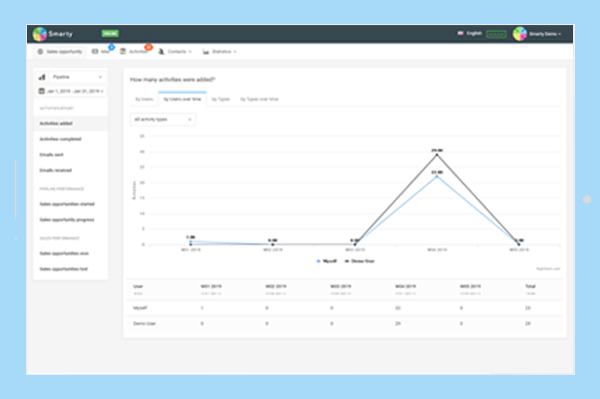 Leverage versatile analytics with Smarty CRM to make reporting a breeze. Collect and collate data to pinpoint strategies which are having a positive effect and single out approaches that are not working as intended. Visualise the findings in a number of different ways, using graphs and charts that are easy to understand and deliver actionable insights at a glance. Create, share and store reports in a variety of widely compatible formats, making it possible to distribute them to colleagues quickly whether they are on-site or out in the field. Compile data on your sales pipeline and assess its value over time, allowing you to make predictions about future fluctuations and be proactive about making improvements. Visual reports allow you to get clearer, more detailed information in a simpler, more readable format. Clear tables and charts allow you to see how you or your team are getting on with clients. The comparison feature also means that with a few clicks you can see how this day, month or year are comparing to those previous. This makes it easier than ever for business owners to find out which parts of their strategies are working, and which are not. Easily visible data means its easier to set goals for the next day, week, month or year. 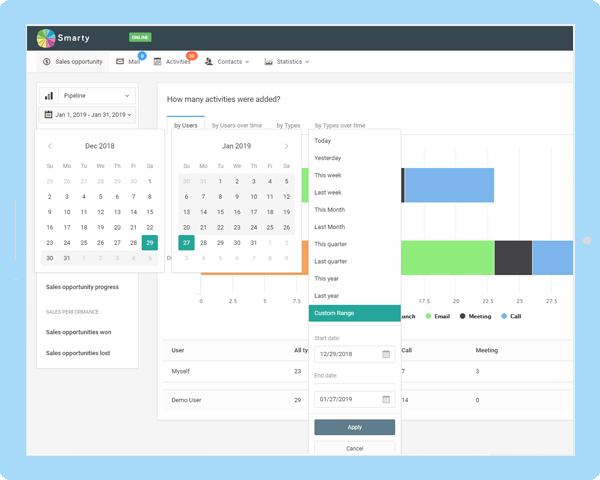 Due to the large amount of statistics that can be easily analysed with Smarty CRM, goals will be accurate and realistic, motivating your team or even yourself to achieve set targets. Goals and targets can then be tracked and measured meaning those that remain incomplete will be flagged, highlighted and carried over to the next period. This has two crucial benefits for your business. Firstly, incomplete goals will not fall through the cracks in the way that paper documentation or older software allows, and secondly, team members will be able to see which goals are incomplete and furthermore investigate why this might be the case by comparison to previous sales targets. Reports are no longer static, black and white, dull documents. 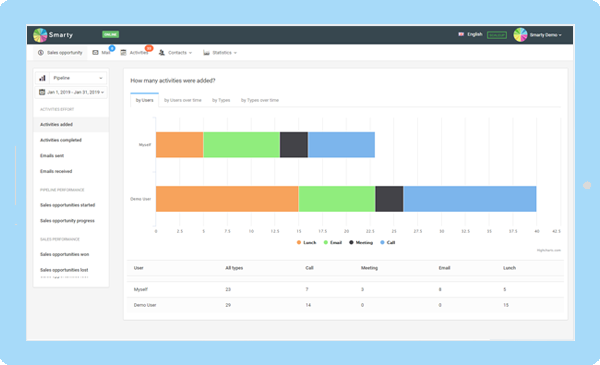 Customisable, colourful and adaptable reports help all members of your team quickly understand the meaning of certain metrics and forecasts. Don’t waste time and money getting accountants or numbers specialists to decode old Excel files. Simply send an interactive report round to your whole team and everyone will be able to take something away from it. If you are not getting what you want out of the report templates that Smarty CRM provides, don’t worry. Simply create your own report style using the simple report creation interface, customise with colours and infographics to help people understand the facts and when you’re done you can download, save, print or send the reports in a number of formats.